From the author of the New York Times bestseller The Autoimmune Solution , a comprehensive, accessible overview of thyroid problems that will help you learn to identify the warning signs and finally take back your health. Are you exhausted all the time, plagued by brain fog, and unable to lose weight? Do you struggle with insomnia, panic attacks, and tremors? But does your doctor insist that your labs are normal, and that you just need to eat less and exercise more? As anyone who has been there knows, nothing is more frustrating, stressful, and emotionally draining than feeling unwell and being told you're fine by the very person who is supposed to heal you. The truth is, your symptoms could be triggered by a thyroid disorder--the hidden cause behind a wide array of health problems that can threaten to ruin your life. Thyroid dysfunctions like Hashimoto's disease, hypothyroidism, and hyperthyroidism affect at least 20 million Americans and yet conventional medicine frequently misses the diagnosis. The scariest part? Most doctors won't even order thyroid tests unless you specifically ask. 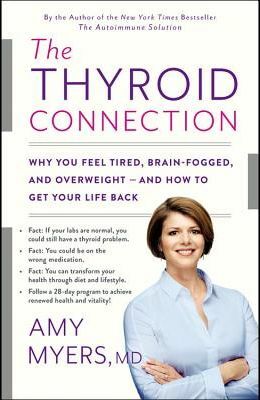 Now, in The Thyroid Connection , Dr. Amy Myers teaches you how to take your health into your own hands. Dr. Myers, originally misdiagnosed herself, understands the struggles of thyroid dysfunction firsthand. Fortunately, she also knows how achievable recovery and well-being are, and just how to get you there. In The Thyroid Connection , you'll discover: How to work with your doctor to get the correct diagnosis What blood tests to ask for, as well as what they mean How to find the right type and dose of supplemental thyroid hormone for you The role of gut health, diet, toxins, infections, and stress in thyroid dysfunction A complete 28-day plan to jumpstart your health and reverse your thyroid symptoms Complete with advice on diet and nutrition, supplements, exercise, stress relief, and sleep, The Thyroid Connection is the ultimate roadmap back to your happiest, healthiest self.